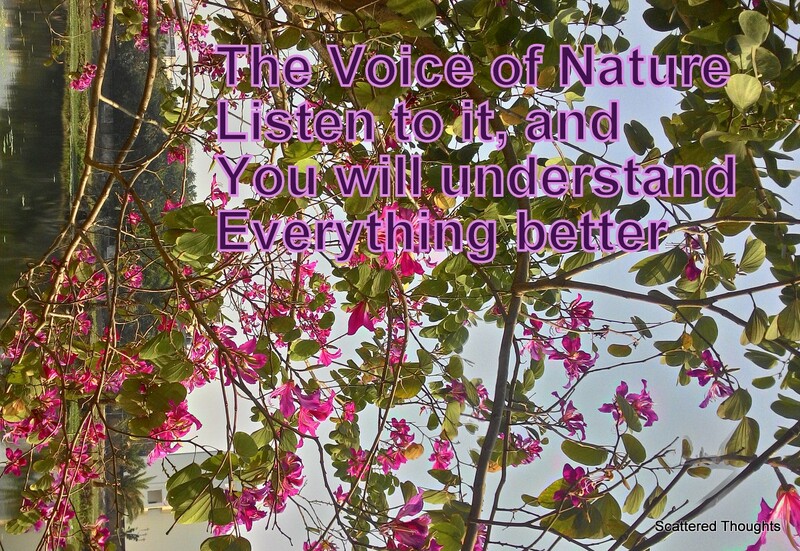 Voice of Nature, Are You Listening? Humankind, love and Nature, nowhere in the history of literature anything has been written without encompassing one or more of these subjects. Since the dawn of civilization, nature is nurturing us fulfilling our every need. The cerulean sky, the verdant valleys, the vibrant waterfall, steep mountains, fragrant flowers, and roaring oceans- all these are perfectly concocted producing a coherent canvas. The invisible yet palpable brush of Almighty changes the shades every day only to make it more beaming and fulgent. With the advent of civilization, we have acquired several techniques making our life comfortable. We have changed the face of the earth; we can now re-paint the canvas created by Him. We can re-create Nature! But do we care for her? Do we ever think how much pain we are causing to her when we mercilessly felled the trees in the name of development? We are an inseparable part of Earth; if she thrives and flourishes, so will us. It’s time to stop the cacophony of the concrete and, listen to the melodies of our eternal nurturer, Mother earth. This is what Nihar Pradhan tries to remind us in his book Voice of Nature. The book is an awakening call for all of us. The protagonist here, Haiku (I especially loved the name and no points for guessing why) a little kid who visits the Nandankanan Zoo located in Bhubaneswar, Odisha, and this journey reveals Nature in a different way to him. The zoo lies among the lush green vegetation of the Chandaka forest, along the picturesque Kanjia lake. Here Haiku meets the tiger Mogli, a rare white specimen, of which the Nandankanan Zoo is famous for, caged and confined, away from his natural habitat and family. The tiger raises his voice to make Haiku realize the pain of being in such a state. Then there is Bani Uncle, the quintessence of wisdom. The Banyan tree or Bani uncle tells Haiku of the nitty-gritty of Nature, of the life as it sees from above. Kuki, the little bird acts as the messenger in the story as it flies in a jiffy from one place to another, garnering all sorts of information. All these characters exchange views, analyze and criticize the acts of humans, the way they have toppled the equilibrium of the ecosystem, blocked the natural growth of forests in the name of development and civilization. Little souls are pure ones, they can understand the melody of a small brook, can listen to the loquacious silence of Nature. So, our Haiku transcends to the world of flora and fauna, understanding every gesture, realizing every word, making himself a conduit to the blockage of miscommunication. He dreams to bring back the once existing harmony between Mother Nature and her children, humans. The name, Mogli, reminds me of the Jungle Book: Mowgli’s Story by Rudyard Kipling, the long-cherished tale of the eponymous hero of the novel, the jungle boy. Voice of Nature is not just a children story, it makes us think of our eternal connection with Nature, the penitence we should have for breaking the communication. The book, I think, brims up the emotion and love for nature and humans. It is equally enjoyable to children and adults. mammoth magnitude of your egos. Human lives have no meaning without communication. The constant conversation between the members of human community has been the bedrock of creativity. Its education, without it your behaviour and your understanding will be no different from animals. We all perish in the whirlwind of nature’s devastation. Nobody knows or can demystify the mystery of the cycle of life in the ecosystem. Great writing Maniparna. If we take care of Nature it will take care of us for centuries to come. An objective review of Nihar Pradhan’s book “Voice of Nature ”. Seems like a really sweet book! Loved the name Haiku too! 🙂 Nature is so soothing and calming if taken care of! The fact that you loved the book is obvious. But what really impressed me is the effort that you have put into this post. It was a pleasure reading about the book and your haiku (and I love the name too). Maniparna, your introduction is quite impressive. We are taking undue advantage of Nature’s Love towards us. In the name of scientific quest & rational world, we indulge in activities, like Deforestation & Construction of Concrete Jungles, and have become a Selfish Beast. I agree that we should rethink over our notion of progress. In China, most of the Smart Cities have become GHOST Cities. We are because of nature, not vice versa. Those who put serious threats on Nature have become extinct. Remember Dinosaurs? One can never experience bliss without being in harmony with nature. Retaining the innocence of childhood with mature perspective is the true wisdom. Author seems to have this rare unique combination. It seems like a great book. I love the message. The quotes you’ve shared are beautiful too. 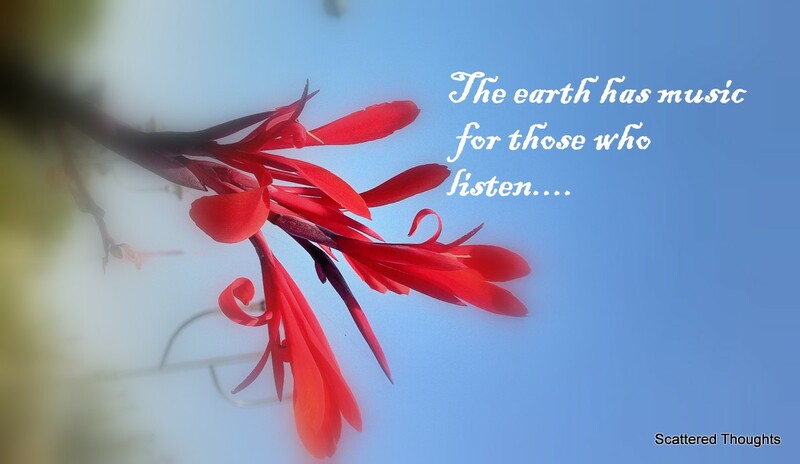 The earth has music for those who listen! Wow!! 🙂 , I like the idea of a message wrapped up in a story. The direct way of moral education has become a little too bourgeois for many I guess. It is a nice way to go and might work really well with the kids. Sounds like a MUST read for me. Being an environmental professional, I think this book is very important for me to read. Thanks for sharing Maniparna. BTW excellent review. I love all those quotes! How many of us have time for all this nature bs? I don’t think many of us care. How artistically have you described the beauty of nature and how aptly awakened human soul! Some of the reflections are beautiful poetry! I agree with you, this book evokes a host of emotions for sensitive people. In a very subtle manner it rakes all those issues, which have been plaguing humanity since the advent of modernisation at the cost of doing harm to our own selves! what man has made of man’? Thanks for sharing this terrific message. Look forward to more at ‘Emotional Shadows’ as it cares about all emotions. Oh, Yes! Wordsworth, one of my favourite nature poets… 🙂 he could transform even the most trivial things into ethereal ones through his words…. Always, we only need to listen. This is a favorite of mine – wonderful post! Thank you Maniparna ~ have a lovely week ahead. Nice review Maniparna. Looks like we are all falling in love with the idea of listening to the Voice of Nature…and shouldn’t we? Now with grey concrete jungles fast replacing the green belts, I do appreciate the reason why town planning is stressed upon so much in some countries. The book makes one think about all such things.